Out of stock since Friday, 19 April 2019. Due back soon. 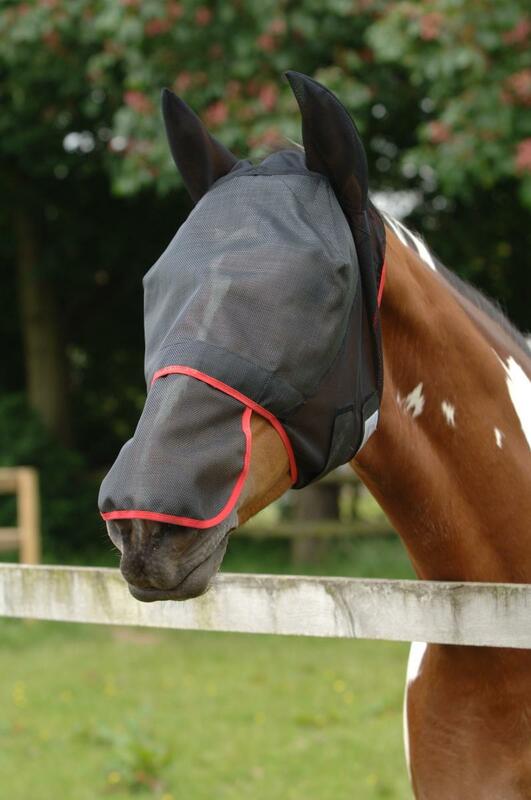 Ideal for protecting your horse's nose from sunburn and pesky insects, the Max Fly Mask from Equilibrium is perfect for protecting the horse's delicate muzzle area. Using a full face net design, it fits the horse from the tips of its ears to the end of its muzzle. Extremely comfortable, it blocks up to 80% of UV rays, as well as having soft sponge padding on the nose and brow areas which prevent rubbing. The Max Fly mask also uses an adjustable and detachable nosepiece which allows the mask to be tailored exactly to the horse and offers excellent visability. A great mask and a great purchase. Also available in donkey sizes. It is very important that you keep the MAX mask clean, not only to maintain a good comfort level for the horse but also to ensure that the horse can see out of the mask. If the mesh becomes blocked with dirt this will seriously affect your horse’s ability to see. Why does my horse snort and blow his nose when wearing the mask? This will usually mean the nosepiece is sitting too low. Remove the mask, alter the length of the nosepiece and put back on the horse. How long can my horse wear the mask? All day but it does need to be removed and checked daily in case of irritation. Wash in warm water using a mild detergent. Rinse thoroughly. Do not tumble dry or dry over direct heat such as radiators. Do not wring or spin. Keep clean to avoid irritation. There are currently no questions for Equilibrium Field Relief Max Fly Mask - be the first to ask one!